Some meetings are nothing more than dissemination of information. The attendees are only there to receive updates from you. After you’ve run through your presentation or agenda, you might have some time for a brief Q&A before everyone leaves. Some projects might be assigned. There are countless tips for better, more productive meetings out there. Despite this, too many meetings today are designed to meet the objectives of the person running the meeting — not the attendees. So, in the end, one person feels better about the meeting while everyone else is scrambling to make that person happy. Meanwhile, time is wasted for something that could be done over email and money is lost while everyone gathers in the conference room instead of getting work done. Here are a few tips for how you can turn your meetings upside-down and make sure everyone gets the most out of them. Not every meeting needs a printed agenda for every attendee. 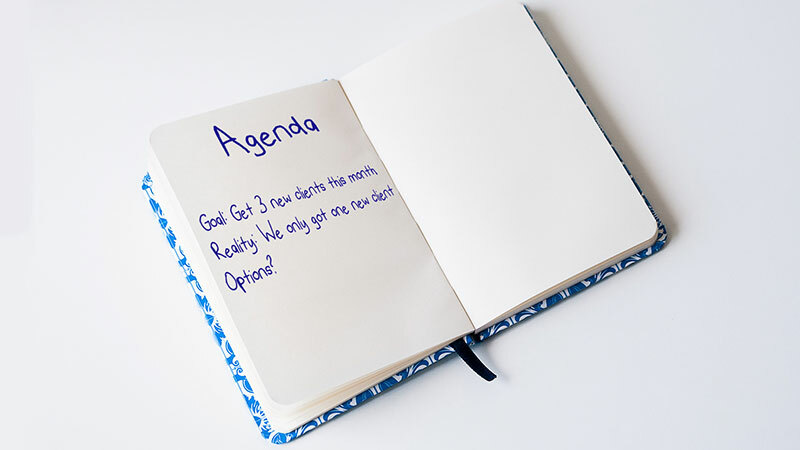 An agenda also doesn’t have to be a formal piece of paper on company letterhead with at least ten bullet point items. When you’re pulling multiple people away from their work, it’s worth taking the time to figure out what you’re going to get out of the meeting. That’s where building an agenda is helpful, even for the smaller, quick meetings. If you’re having a hard time putting together an agenda, the meeting probably isn’t necessary. After everyone settles in and before getting to the meat of your meeting, try asking this question: What do you want to get out of this meeting? Jot down the responses. Some of them you may be able to meet. When the meeting is done, recap the expectations. Were they met? Why or why not? This is great feedback for you to lead a more effective meeting next time. Don’t disregard the expectations that weren’t met. They’re simply off-topic for your current meeting. Instead of wasting everyone’s time by trying to resolve them right away, add them to your meeting’s parking lot. Make a point to follow-up with that person to clarify the mismatch in expectations. Then you can decide if you need to add that to the agenda for a future meeting, one-on-one or follow-up. For well over a decade, I ran a tech company in Digital-Tutors. It was always a surprise to people outside the company that we had a no-tech rule at meetings. Sure, we’d have computers to run presentations or for video chat — but everyone left their phones and laptops at their desk. Why? Because when you’re in a meeting, you should be there mentally as well as physically. It’s too easy to see an email notification, a customer support ticket pops up or a Slack message come through. Even if you’re able to resist the temptation, your mind will get distracted. Removing tech from your meetings might not work. But, it might. If you’re running into distraction issues, try removing it to see if it helps. In the 10+ years at Digital-Tutors, there were one or two times when an emergency came up that required interrupting the meeting. Everything else could wait until they got back to the desk — until then, they’re fully focused on being an active participant in the meeting. For every meeting, every person in the room should be interactive. Ultimately, this means only people who need to participate in the meeting should be there. As you’re putting together the meeting’s agenda, think ahead about what you’re going to be covering in the meeting and only invite the people who need to participate. Meetings shouldn’t be a status symbol; they’re a tool for getting things done. Your people’s time deserves more respect than including them in every meeting just in case they might need to be there. Updates can be emailed. Information can be passed on after decisions are made. This is one reason why removing distractions can be so important. If they need to be handling customer issues or working on a different project instead of being in the meeting, why are they there in the first place? There’s no need to waste time including them when their time will be best used elsewhere. Once in the meeting, everyone participates. Everyone plays. No one is sitting off in the corner by themselves or mentally in a difference place as they’re tapping away at their keyboard. It’s natural to connect with stories. They’re a big part of adding meaning to your work, so the projects you’re taking on have a reason behind them. As you’re building the agenda for a meeting, think about the reason behind the meeting. Was there a customer who noticed a bug? Tell their story so your dev team can place meaning behind why it’s important to find a solution instead of just another issue they need to fix. You won’t always have a story that inspired the meeting. In these cases, try kicking off the meeting with something that made them happy that day. It’s a great way to break the ice and get everyone in the mindset of being present for the meeting. When you go into your meeting with an agenda, you’ll know what you need to cover and who needs to be there. Then, kicking off the meeting with an ice-breaker and setting expectations helps everyone mentally prepare themselves to be an active participant in the meeting. Throwing in some stories into the mix can help take the challenges you’re working to overcome from the realm of abstract and into reality. I always like to end my meetings with the same two items. The first is a quick recap. Make sure everyone’s expectations were met, or jot down any mismatched expectations to follow-up on later. Reiterate any decisions made for final clarification. Make sure everyone knows what’ll happen and who is in charge the action items coming out of the meeting. Lastly, go around the room and ask one simple question: What’s your big takeaway from the meeting? There’s no right or wrong answer. If the answers come as a surprise, use it as a chance to improve your meeting’s agenda for next time.